Golf Cart Rental Put in Bay: See in Style! Put in Bay Golf Cart Rentals are available to rent by the hour, rent daily and overnight from the Put in Bay Golf Cart Depot. BOOK NOW to ensure you have your way around the bay! We have high quality brand new Yamaha Golf Carts. Carts are available in two person, four person and six person configurations. Explore the Village of Put-In-Bay and the rest of South Bass Island on more than 9 miles of paved roadways. Take in scenic vistas and admire the Victorian charm of the island. A Golf Cart Rental on Put in Bay is great for transportation to your Hotel. The 2 passenger electric golf carts are a fun and quick way for couples to cruise the island for the day. If you’re bringing the kids, our 4 passenger electric golf cart will be a great choice. The Golf Carts are equipped with safety features. These include, retractable seat belts to keep your precious cargo safe and secure, windshield and reflective markers. Additionally, the ride is smooth and quiet due to being an electric Put in Bay Golf Cart Rental. Why Choose A Put in Bay Golf Cart Rental from Us? We are Proud to support our local economy. 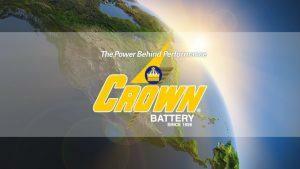 All of the Put-in-Bay Golf Cart Depot Golf Carts are powered by Crown Battery of Fremont, Ohio. The 4 passenger and 6 passenger 6 gas golf carts are your passport for transport. 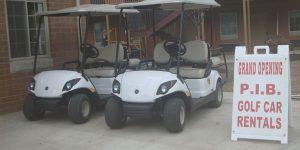 Moreover, these golf cart rentals are available overnight and weekly. We have a newer fleet of Yamaha fuel injected carts that will enhance your visit to our island paradise. Furthermore, they achieve over 35 MPG. So, running out of gas is never an issue for your multiple day or weekly golf cart rental. These carts leave the rest of the Golf Cart Rental Put in Bay in the dust! If you really want to step up your game, try one of our Custom Yamaha Adventurer Sports. These carts offer a 3 inch lift kit, sporty tires and wheels. Also, there is a fold down back seat for hauling groceries or gear if needed. These are the finest rentals available on P.I.B., offering a great value in your overall experience. The golf cart rental Put in Bay typically will rent from April through September. Also, we are offering an ELECTRIC ASSIST BICYCLE for a new way to see the island. Get your exercise, but have some help along the way. These will be on a limited supply basis, so please call for info about both the Bicycles and the Golf Cart Rentals. Whether you just left the Miller Dock or your Put-In-Bay Hotel, an excellent Put in Bay Golf Cart Rental awaits. Rent for a few hours and see what you can. Rent for the whole day and take you and your passengers to a place and location like no other. Golf Cart Rental Put in Bay are a fun way to see the island in April during the annual Pajama Party at Mr. Ed’s and for the thrilling Boaters New Years in September. No matter the time, Golf Cart is the way to see Put in Bay. Put-in-Bay Golf Cart Depot and Victory Station Hotel is located on Catawba Avenue, just a short walk from the downtown ferry, next to the Reel Bar. Also, the location can be easily found from the Miller Dock. Simply drive down Langram and turn on Concord Ave. After passing the Put-In-Bay School, turn right. The Golf Cart Rental Put in Bay is up the road on the left.